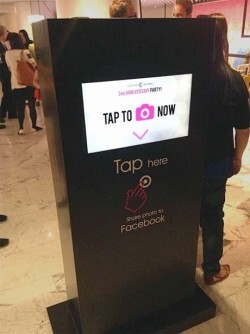 Hong Kong fashion retailer Central Central has used NFC at a party celebrating its second anniversary. By checking in at NFC tablets placed at key locations around the store, guests could interact with motion-based games and a photo booth, post updates and photos to social media, and enter a prize draw. Each guest received an NFC wristband which was connected to their Facebook profile when they checked in. They could then use the wristband to access the events and automatically post updates and photos to their Facebook profile. A big screen display was used to provide a sudoku puzzle game and a digital shopping wall where participants could select their favourite items. According to Alvin Li, digital creative director at social media marketing specialist Pixo Punch, both used motion gesture technology. Participants activated them by tapping their wristband to an NFC reader. “Once they had finished the game in a set amount of time, an e-coupon was auto shared to their email and an announcement made on their Facebook timeline,” Li explains. Consumers could also tap their wristband to an NFC-enabled photo booth and snap a picture using various props and backgrounds. The image was then immediately uploaded to Facebook. Within the first two hours more than 250 participants had uploaded at least one photo to their Facebook page, creating “an instant viral effect”, says Pixo Punch.